It’s Valentine’s Day, love is in the air and I have fallen head-over-heels for a sandwich. The relationship started on a rainy day when getting out felt like an achievement. I stopped for a pick-me-up at Piece, an unassuming café on 1056 Argyle Street that makes the most delish gourmet sandwiches. I’m greeted by lovely woman who actually takes the time to explain how it all works. Welcome to freshly baked bread and a range of quality ingredients from pastrami to mango and lime salsa to spicy sauces, soup, and mouth-watering desserts. Choose from a pre-set selection of sandwich combinations or freestyle from the ingredients on offer. I go for the Caesar described as ‘roast chicken, parmesan, garlic mayo and leaves’. But this description doesn’t do this god of sandwiches justice. The garlic mayonnaise coupled with olives and cucumbers round off this sumptuous sandwich. My husband’s towering chicken ole looks like a work of art – and with recommended added chilli mayonnaise, he’s in heaven. My kids free style and are so impressed that they’re already planning their next trip. The lime and coconut sponge and chocolate brownie – seals the deal. Piece is a new favourite. Simple pricing for any sandwich, regardless of ingredients (£3.95 take away and £4.95 sit in) makes it impossible not to adore. So go on – fall in love for all the right reasons with the utterly delicious Piece. I plan on eating my through the menu. Next up Jamaican chicken…or possibly falafel. Or maybe I’ll freestyle. 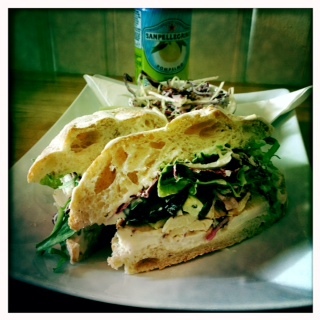 This entry was posted in Glasgow cafes, Gourmet sandwich and tagged #inglasgow, About a city - Glasgow, Glasgow food. Bookmark the permalink.